ESPN The Magazine's hotly anticipated "Body Issue" hit newsstands on Friday, and at least one of the covers — a portrait of Chicago Cubs infielder Javier Baez — was shot using Apple's iPhone 7 handset. Seen above, Baez's cover is a standard portraiture-style image of the baseball star in the buff. As noted by venture capitalist M.G. 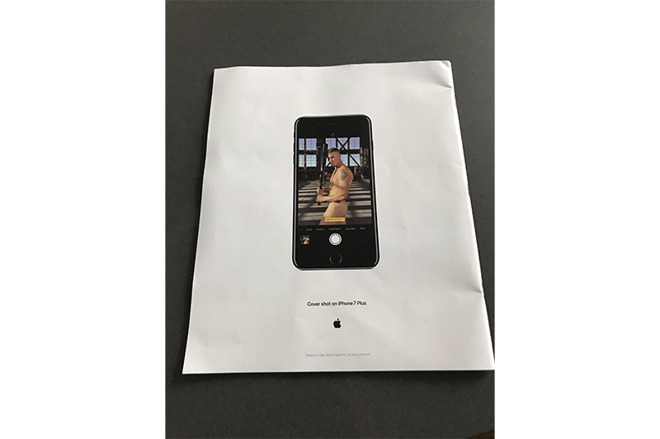 Siegler on Twitter, Apple purchased space on the issue's back cover to advertise that the shot was captured using an iPhone 7 Plus. Apple's ad shows an iPhone 7 Plus alone in a sea of white with Baez's cover shot, minus ESPN's graphics, displayed onscreen. The handset is set to Portrait Mode, an iPhone 7 Plus-only feature that uses the handset's dual camera array and computer vision to simulate bokeh, though it is unknown if the actual image was captured using the Photos app tool. Fine print below on the back cover notes the photo was edited using a Mac. ESPN used multiple iPhone 7 units, as well as third-party equipment to capture the Baez shot. Photographers can be seen toting iPhone 7 Plus on tripods, free-hand and what appears to be a DJI Osmo gimbal in a behind the scenes video of the photoshoot posted to YouTube last week. One brief clip shows photographers gathered around an on-site production cart, on top of which sits a MacBook Pro connected to an iPhone 7 Plus in a Beastgrip Pro. Every year, ESPN enlists athletes from a wide range of sports to bare it all in the Body Issue, which the magazine touts as a celebration of fitness. Baez is one of ten athletes to be featured on nine distinct covers. Other cover models include New England Patriots wide receiver Julian Edelman, Dallas Cowboys running back Ezekiel Elliott, Los Angeles Sparks forward Nneka Ogwumike, Boston Celtics point guard Isaiah Thomas, San Jose Sharks players Brent Burns and Joe Thornton, mixed martial artist Michelle Waterson, tennis star Caroline Wozniacki and Kirstie Ennis. Ennis, an accomplished mountain climber and amputee athlete, is the first veteran to feature on a Body Issue cover. Whether other cover shoots were accomplished with iPhone 7 Plus is unknown, though behind the scenes videos for Edelman, Wozniacki and Ennis, among others, showed only professional equipment being used in staged settings. Inside, the magazine highlights photos of Akron Racers outfielder A.J. Andrews, Chicago Red Stars defender Julie Ertz with husband Philadelphia Eagles tight end Zach, rugby standout Malakai Fekitoa, skier Gus Kenworthy, figure skater Ashley Wagner, track and field sprinter Novlene Williams-Mills and the U.S. Women's National Hockey team.